When I got to the corner of Bushwick Avenue and Devoe Street, last Saturday, on one of the rainiest day of this young spring I was not expecting to see a great exhibit. To my surprise, as soon as I entered the intimate (and dry) space of Vaudeville Park, I realized I was about to be rewarded for having made it all the way to that small Brooklyn gallery. 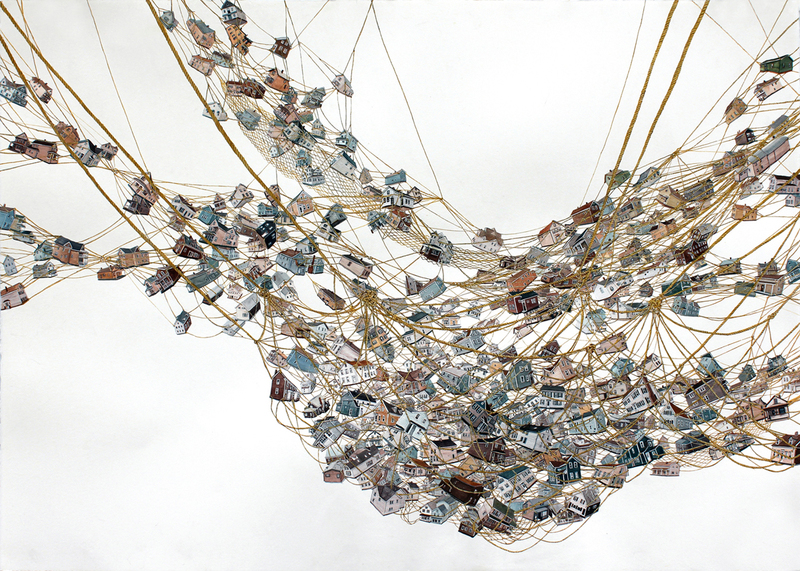 (Above) Theresa Bloise, Sea Pile, 2010, Watercolor on paper. Maya Brym, a New York based artist, had the idea of organizing April Sky after meeting artist, Theresa Bloise at an information session for 2010 Fellowship recipients of the New York Foundation for the Arts (NYFA). Vaudeville Park seemed a perfect match for the show as it recently obtained fiscal sponsorship by NYFA and is on its way to becoming an independent 501c3 non-profit. 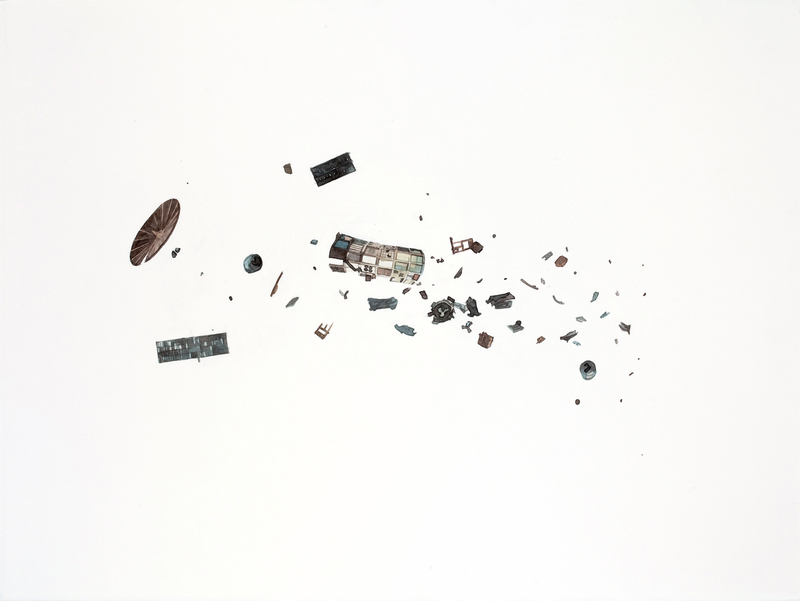 (Above) Theresa Bloise, Orbital Debris, 2008, Watercolor on paper. “I saw Theresa Bloise’s paintings and they resonated and reminded me in different ways of the works of Gina Ruggeri, Brian Zegeer and Amy Casey — artists I’ve met in different places over the past fifteen years whose work has affected me and stayed in my mind. I think I wanted to see how the works would interact together in the same space,” said, Maya Brym. “I also felt there were some common themes among the works that I wanted to understand better,” Brym continued. Painting in watercolors, Theresa Bloise floats her images in ample white fields. The space is within, but not enclosed by the edges of the paper. 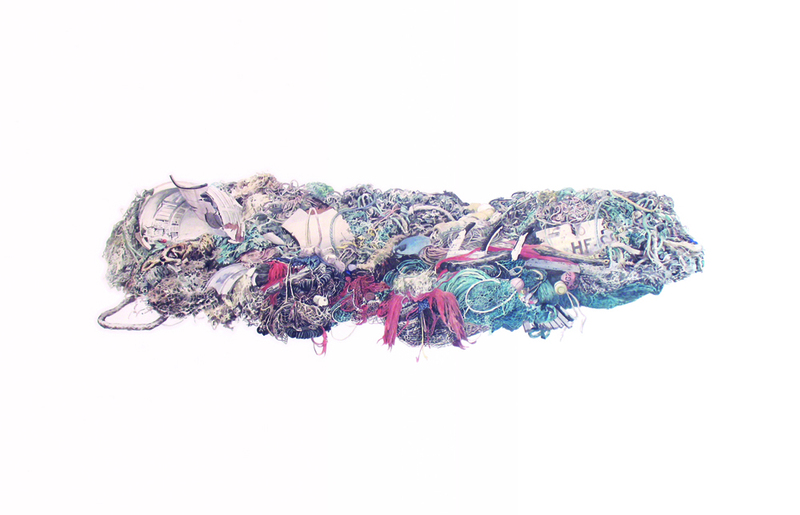 In her large-scale painting Sea Pile, the assemblage of marine garbage in various scales gently lay together shaping a new whole. It could recall the shape of a beached whale, but it is unnecessary to define it as the sense of delicateness of the watercolors and the grace of the decaying materials exist within their formal representation and their imaginative new dimension. 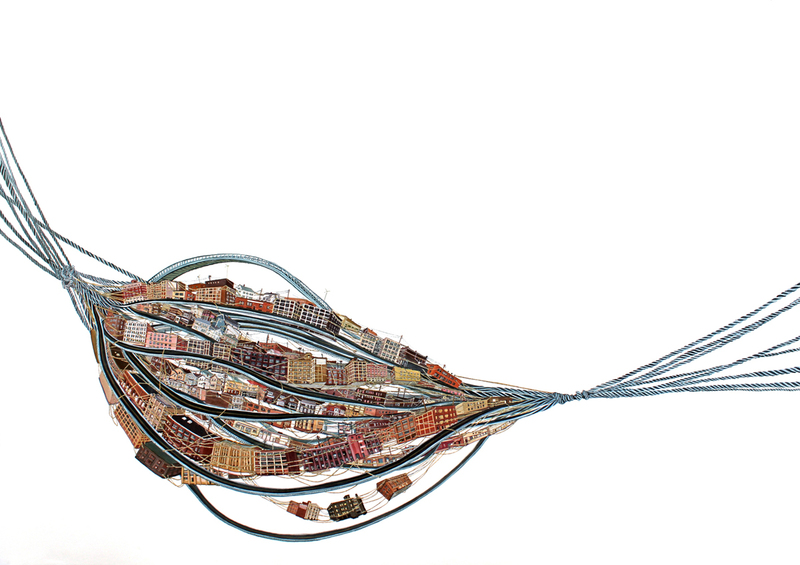 (Above) Amy Casey, Ballast, 2011, Acrylic on paper. Amy Casey’s paintings of uprooted houses and buildings mesmerize with their intricate arrangements of innumerable, minutely detailed forms. The limited palette – consisting of pale blues, rich browns, dusty pinks and warm ochres – is understated and kaleidoscopic at the same time. It is almost possible to see the inhabitants of this floating village looking outside their windows and into the vastness of the void. Gina Ruggeri’s large-scale acrylic painting on mylar, Cavern Plume, appears as a strikingly unitary image that simultaneously recedes into the wall while emanating out of it, involving the viewer in being part of it while trying to catch it at a glance. The facture of the painting is delicate, while the image projects desolation and possible violence, a subtle comic sensibility, and above all, a radical freedom. 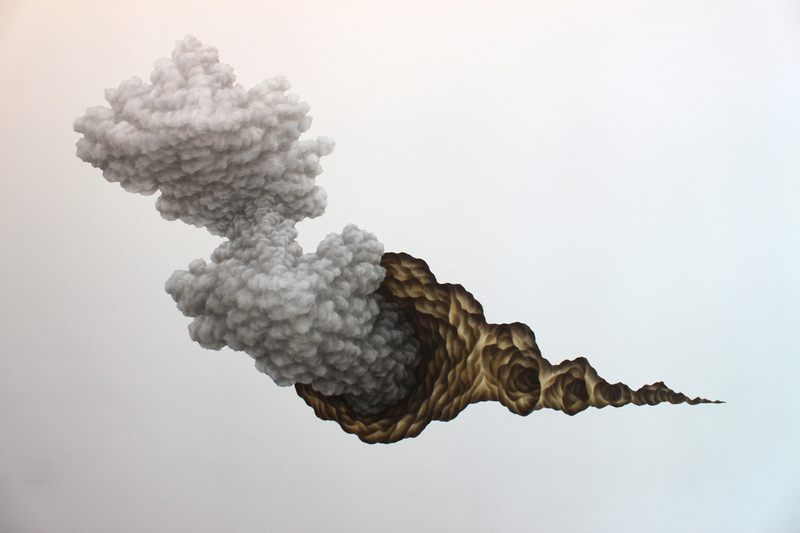 (Above) Gina Ruggeri, Cavern Plume, 2009, Acrylic on mylar cut-out. In the distinctive rhythm of stop-motion video, set to a banjo score, Brian Zegeer’s mirror shapes begin to wiggle and rotate as they move toward the periphery of a platform and make way for a highly suggestive architectural form that rises from the middle like a futuristic vessel or a lost Atlantis. Part of the fellowship that sparked the idea for this show, is a program called Artists & Audiences Exchange, which encourages artists to give public presentations about their studio work. 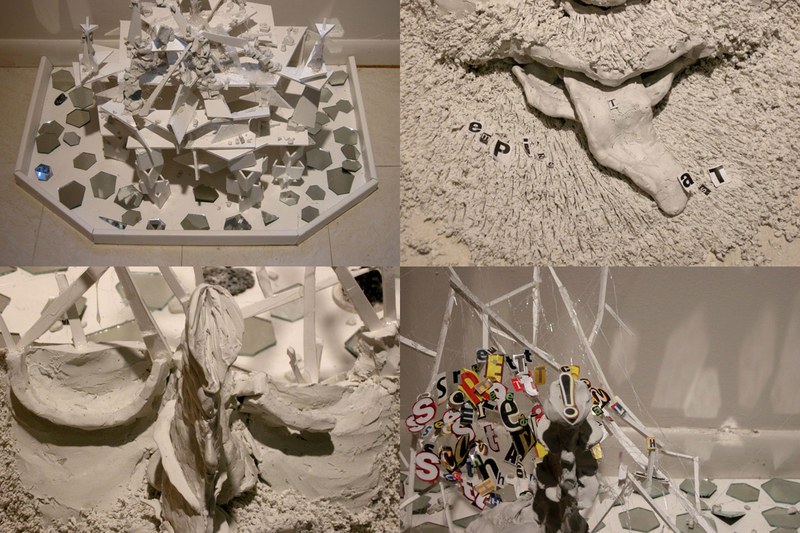 As a consequence, there will be an artist talk at the closing reception on April 30th in the gallery. Vaudeville Park is an artist-run, multimedia venue in Williamsburg. The founder, Ian M Colletti, is a fantastic musician who created sound installations for the opening and closing parties for April Sky. The show is very well curated bringing together a variety of work in different mediums. It reflects a sense of suspension leading the viewer to wonder between the vastness of unlimited spaces and the interiority of artists’ personal visions. In the cozy space of Vaudeville Park here is an extraordinary opportunity to be captured by interesting works by artists you might want to keep an eye on!